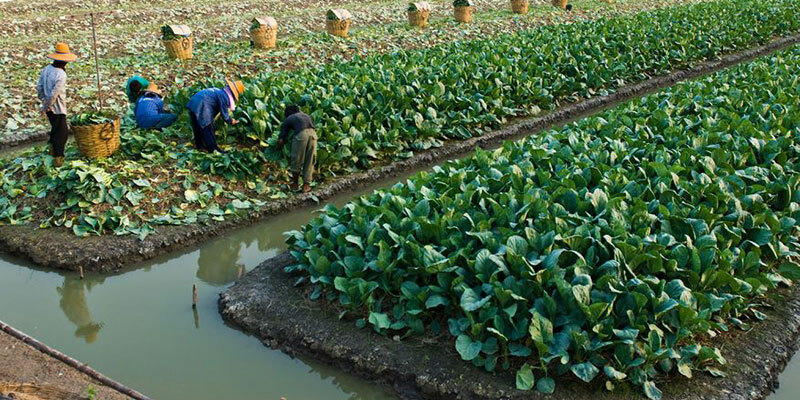 Many farms in countries including China are highly reliant on wastewater for irrigation, which may affect public safety. A recent study reveals that the amount of water originating from urban wastewater used for crop irrigation around the world is much higher than thought. For the first time, researchers decided to assess not only the direct use of wastewater for crop irrigation, but also its indirect use, for instance, when wastewater is diluted in fresh water but remains a large component of the water. Because of inconsistent opinions on where to draw the line between polluted water and diluted wastewater, most previous studies did not differentiate water use, even though the use of diluted wastewater for irrigation is prevalent worldwide. Wastewater is a broad term referring to one of two main types of effluent from individual households and commercial facilities and institutions: blackwater and grey water. Blackwater is any sewage originating from toilets, kitchen sinks, and dishwashers. It contains human or animal waste, as well as a variety of chemicals and contaminants from cleaning agents. Blackwater is highly pathogenic and needs to go through a wastewater treatment plant before being released the environment. Grey water is the wastewater that originates from bathroom sinks, bathing fixtures, and laundry fixtures. Because it does not contain human or animal waste, it is suitable for water reuse. Domestic sewage from homes and businesses produces a very high volume of wastewater. In areas with a well-developed water infrastructure, domestic sewage goes through a wastewater treatment plant before reaching fresh water. In regions where wastewater treatment capacities are limited, large quantities of wastewater often contaminate surface waters. Other types of wastewater originate from stormwater, floodwater, urban surface runoff, as well as runoff from landscaping and agriculture. This type of wastewater is derived from many sources and often reaches freshwater sources without any cleaning. It may contain sediments and trash, as well as toxins and chemicals. [T]he use of wastewater (both treated and untreated) in irrigated agriculture has been documented in more than sixty countries, though the true scale of the practice is likely underestimated. […] Globally, less than 10% of collected wastewater receives any form of treatment. Some farmers use wastewater because of its high nutrient content, which reduces the need for costly fertilizers. However, most farmers rely on wastewater simply because it is their main source of irrigation water. Of these croplands, 29.3 Mha were located in countries with low levels of wastewater treatment and home to 885 million urban residents. While the use of wastewater is understandable in regions suffering from water scarcity, it can impact consumer safety, and researchers see a growing need to mitigate public health risks that may affect the food chain. Preventive steps aimed at food handling and preparation may help, but the main issue is reliance on wastewater instead of clean water. As long as investment in wastewater treatment lags far behind population growth, large numbers of consumers eating raw produce will face heightened threats to food safety. Because of ongoing population growth and increases in food demand, communities with a low supply of fresh water must develop sustainable solutions for crop irrigation. Fluence provides a variety of reliable and cost-effective wastewater treatment options. One particular technology uses up to 90% less power for aeration than conventional aerobic treatments. Fluence’s innovative membrane aerated biofilm reactor (MABR) integrates a natural nitrification-denitrification process and passive aeration to treat sewage and other wastewater for crop irrigation. This wastewater treatment technology is particularly useful in agricultural areas located close to urban areas that produce a large amount of wastewater. The study — “A global, spatially-explicit assessment of irrigated croplands influenced by urban wastewater flows” — was published in the journal Environmental Research Letters.